The Field Notes Byline reporter notebook is the Summer 2016 quarterly edition from Field Notes. This top wire bound notebook lays open flat and is great for note taking. Each notebook has 70 college ruled 70#T vellum pages in Cougar Natural and an inside pocket. The cover is made of Neenah Environment 120#DTC in the Wrought Iron color. The bottom corners are rounded with 3/8" arcs. The notebook measures 4-3/4" x 7-1/2" and are printed in the U.S.A. The Cover is printed in soy-based Federal Blue, Saphria ink and the inside with Double Knee Duck Canvas. Each Field Notes Byline comes in a pack of two reporter notebooks. 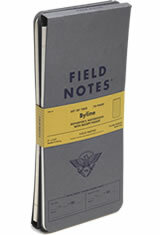 The Field Notes Byline Memo & Notebooks usually ships within 1 business day unless otherwise specified. Each Field Notes Byline Memo & Notebooks we sell is guaranteed to be genuine, authentic and will arrive brand new & unused! Does the word "pages" mean "sheets" (with 2 sides) or one side of a sheet? One page is the front of the sheet of paper and a second page would be the back of that sheet of paper. Just like in a novel which has it’s pages numbered. There is only 35 sheets of paper in the Field Notes Byline.